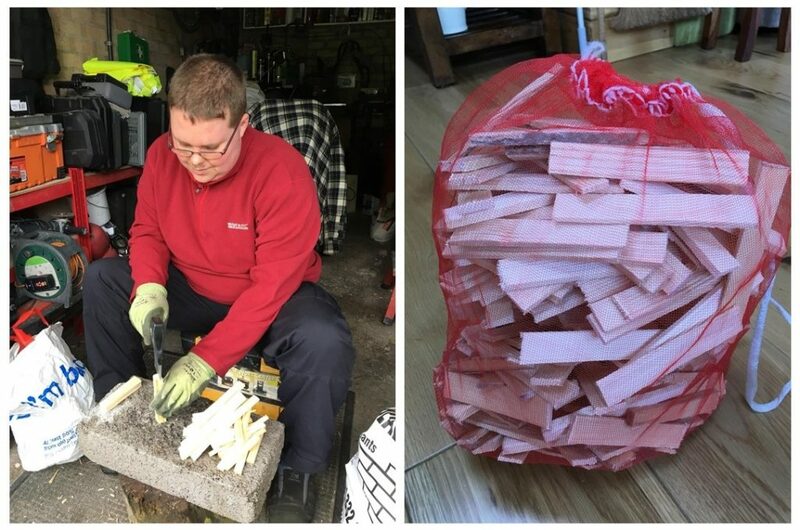 Derbyshire live event production company On Event Production Co. is backing a social enterprise set up by a young person with autism, by donating waste wood to be chopped into firewood and sold to the community. Greg’s Sticks was set up by Greg Richardson, 25, of Stanley, in Derbyshire, who has autism which affects how he communicates with and relates to other people and experiences the world around him. To help him manage his condition and occupy his time, his family bought Greg a shed, which he uses to chop wood into kindling, which is then packaged and sold to shops in his local community. Greg’s father, Tony, had been buying the wood in for Greg to chop. But, following a conversation with family friend Guy Eaton, managing director of Castle Donington-based On Event Production Co., a deal was struck which will see the firm donate the wood it recycles from event sets, stages and props to Greg instead. Guy said: “We literally get through dozens of skips full of wood every year, which all ends up being recycled into chippings. It’s great that we can put it to another use and help a local family in the process. “Not only will this provide Greg with the opportunity to generate a revenue, it will help us to put more of our waste wood to better use through recycling it via a social enterprise that is valued by the whole community. In turn, Greg’s family have agreed to donate all the income raised from the sales of kindling to charity including those supporting autism and cancer research which will of course benefit the wider community. Tony added: “This is a wonderful gesture from Guy and his team to support Greg and enable him to enjoy his hobby, occupy his time, develop his skills and donate money to charity in the process. Guy said that the company uses a huge amount of wood every year and is urging any community groups or social enterprises which could put the wood to better use to get in touch.